TANMS works to engineer a revolution in miniature electromagnetic electronics through development of a new class of nanoscale multiferroic materials. 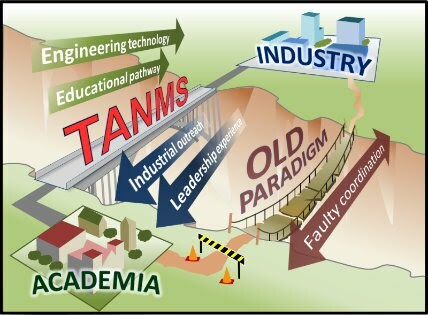 Beyond development of new, optimal electromagnetic materials, TANMS seeks to increase its capacity for innovation by integrating its research with commercialization, and fostering life-long skill development. TANMS brings together diverse, domestic and international talents to stimulate their pursuit of engineering careers in the United States. Our education program works with students from K-20 to instill a thirst for technological innovation, and provide the appropriate entrepreneurial skills for long-term success in the engineering world. We at TANMS seek to foster an array of individuals with our compelling diversity strategy- it aims at increasing the participation of individuals from traditionally under-represented groups in collaboration with source departments and schools to create a diverse, inclusive environment.